In this post, I have written about the Hum or हुं Mantra Vibration, which is the simplest and most effective Kundalini Shakti Arousing Mantra. This Beej Mantra will stimulate and awaken the dormant Kundalini Shakti, which rests in the Muladhara Chakra. Tantra Shastra says that the Cosmic Being or the Universal Brain resides in humans in the Sahasrara or Crown Chakra, located at the top of the head. When the Kundalini Shakti, which lies dormant in the Root or Muladhara Chakra, located in the base of the spine awakens and reaches the Sahasrara Chakra, the Sadhak undergoes a total transformation in everything and gains access to higher or supernatural powers, like Extra Sensory Perception or the Sixth Sense and other Occult Powers. However, most Sadhaks make the mistake of thinking that the process on awakening the Kundalini Shakti is some sort of mechanical or scientific exercise, including Yogic exercises. The raising of the Kundalini is the process that is linked to the mental evolution of the mind, which commences when the mind starts thinking in a specific way. Dissatisfaction with the present state of existence and striving for a higher state that transcends the limitations of the present state is one of the signs that the mind is undergoing a change. The mind of the Sadhak who is practicing severe Mantra Sadhanas for getting supernatural powers is also undergoing a change. The Sadhak wants these supernatural powers or Siddhis so as to overcome the limitations of his present state of existence. Thus the urge to gain powerful Siddhis is linked to the changes occurring in the transforming mind of the Sadhak. The urge to gain Siddhis is part of the movement of the Kundalini Shakti in the body of the Sadhak, however, many Sadhaks are unaware of the fact that it is their internal mental process and mistakenly attribute the urge to many other things, including God and Guru. For those people whose Kundalini Shakti is still dormant or those who want to awaken their Kundalini Shakti, but are confused because of large volume of information and complicated procedures, which are available to them, I will give give the most simple, yet the most effective Mantra to stimulate the Kundalini Shakti. The Sadhak aspiring to stimulate his or her Kundalini Shakti should keep chanting the Hum- हुं Mantra. 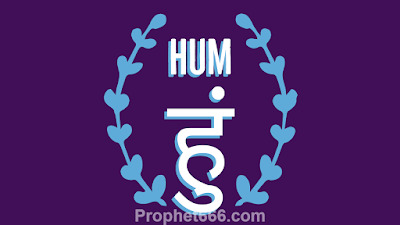 Hum is the Beej Mantra that arouses the Kundalini Shakti from its dormant state in the Muladhara Chakra. LAM or लं is the recognized Beej Mantra of the Muladhara Chakra and the Universally Prescribed Beej Mantra to arose the Kundalini Shakti from its dormant state in the Muladhara Chakra. However, the Hum or हुं Beej Mantra Vibration will work better in stimulating and arousing the Kundalini from its dormant state. Note- This Kundalini Mantra Meditation is suitable for Sadhaks who are ready for the Kundalini awakening process and not for lay-persons. Lay-persons are most likely to be confused by the sudden arousing of the Kundalini Shakti and unable to interpret and understand the Occult Powers connected to the Kundalini. Hello thank you for this site. Would Aum Lam Hum Namaha or Swaha be a good mantra to incorporate both vibrations? Depends on your personal experience, in my opinion Hum is sufficent for this purposse. How many times a day chanting is ideal? Does chanting requires a mala? And is the pronunciation 'hooommm' or 'haammmm' as many are prouncing it as 'haammm' pls clarify.